Plant Notes: This taxon is recognized by its copiously hairy leaf sheaths and blades, although it apparently intergrades into var. scoparium (FNA, vol. 25). Citation SCHIZACHYRIUM SCOPARIUM (Michaux) Nash, var. DIVERGENS (Hackel) Gould, Brittonia 19: 73. 1967. Basionym: Andropogon scoparius Michaux, var. divergens Hackel 1889. Type: TEXAS: Jasper Co.: Without locality, 16 Oct 1987, Gandhi 339 (neotype: NLU; isoneotypes: GH, MO, NCU, NY, TAES, TEX, US). Neotypified by Gandhi & Smeins, Harvard Pap. Bot. 8: 68. 1996. Andropogon divergens Andropogon divergens (Hackel) Andersson ex Hitchcock, J. Wash. Acad. Sci. 23: 456. 1933. BASIONYM: Andropogon scoparius Michaux, var. divergens Hackel 1889. Andropogon scoparius var. 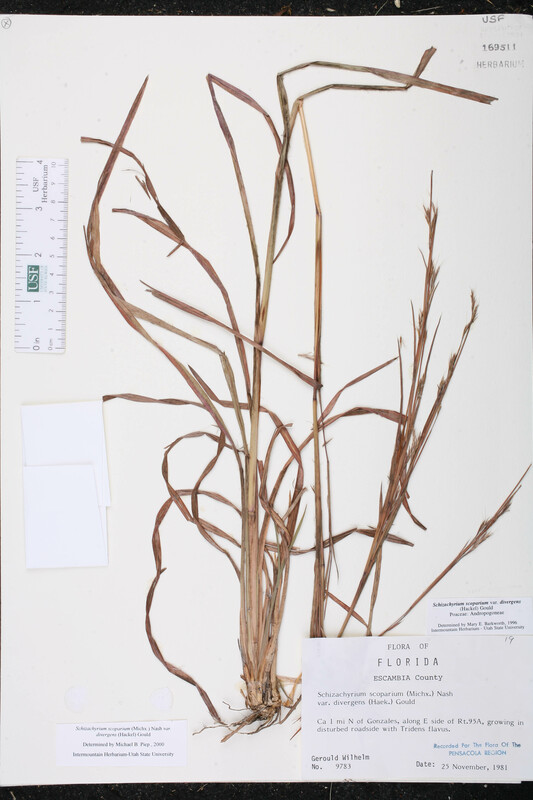 divergens Andropogon scoparius Michaux, var. divergens Hackel, in Alph. de Candolle, Monogr. Phan. 6: 385. 1889. TYPE: TEXAS: Jasper Co.: Without locality, 16 Oct 1987, Gandhi 339 (neotype: NLU; isoneotypes: GH, MO, NCU, NY, TAES, TEX, US). Neotypified by Gandhi & Smeins, Harvard Pap. Bot. 8: 68. 1996. Schizachyrium scoparium subsp. divergens Schizachyrium scoparium (Michaux) Nash, subsp. divergens (Hackel) Gandhi & Smeins, Harvard Pap. Bot. 8: 68. 1996. BASIONYM: Andropogon scoparius Michaux, var. divergens Hackel 1889.